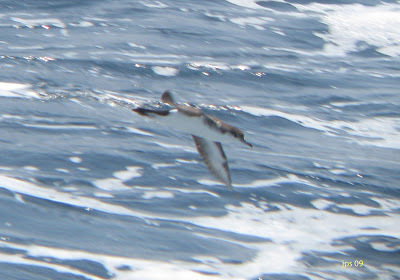 Images from last week's twenty-four hour pelagic to the Block Canyon area, RI. We stayed strictly within RI waters. Our outward journey through the night was hampered by storm activity causing the Captain to divert and go around around the storms resulting in us falling well short of our 'hoped-for' arrival in shelf-waters at first light. Never the less, we had a very successful day with an impressive tally of at least 26 Audubon's Shearwaters, the most I've seen in a single outing off the New England coast. These included one group of four and one group of three birds. 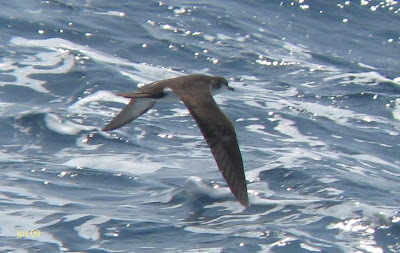 On the down side, the trip was a little slow in terms of variety with no jaegers or skuas though we did see a decent example of Scopoli's Shearwater on the return journey. 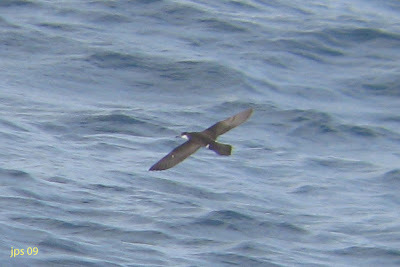 The most frustrating bird of the day was a near-certain Band-rumped Storm-petrel seen in mid-morning by just a handful of us from the stern of the upper deck. All in all, this was a very enjoyable experience with some very nice people. All of these are digibinned images using Canon Powershot A590 and Leica 8x42 binoculars. 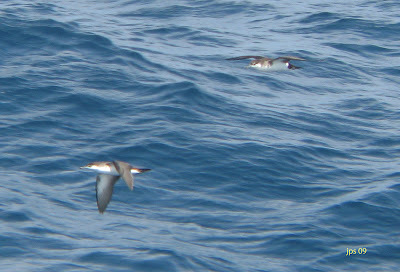 Group of 4 Audubon's Shearwaters, north of the head of Block Canyon.